SINTAVIA is the global leader for independent metal additive manufacturing (AM) in support of critical industries, including Aerospace & Defense, Oil & Natural Gas, Automotive, and Ground Power Generation. The company is committed to parameter optimization and quality serial production of metal parts that meet or exceed the exacting standards of these industries. No other independent AM company in the world possesses the same in-house capabilities as Sintavia. With six high-speed printers from four of the largest global OEMs co-located alongside a hot isostatic press, a vacuum heat treatment furnace, an industrial CT scanner, a wire EDM, a full complement of mechanical testing equipment (including high temperature tensile, fatigue, and creep testing), a full metallurgical laboratory (including a scanning electron microscope and optical emission spectroscope) and a micro powder lab, Sintavia is able to optimize parameters, serially manufacture, and audit quality much faster than any of its competitors. Doug Hedges, the President of Sintavia is a mechanical engineer and an additive manufacturing professional. Doug’s experience includes part manufacture approval (PMA), designated engineering representative (DER) repairs, OEM part manufacture and design, and large scale jet engine maintenance, repair, and overhaul (MRO). Recently, Doug set out to prove the ability to additively manufacture aerospace replacement parts. 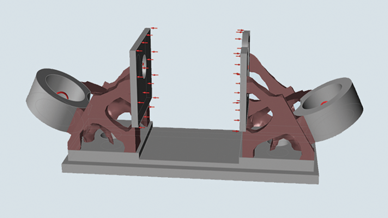 Doug’s goal was to produce optimized designs of aerospace brackets that meet or exceed the existing bracket’s mechanical properties while decreasing the overall weight of the parts. To do this, Doug relied on a component he encountered in a previous career. The component that Doug selected is based on an aftermarket aviation part for a low pressure turbine. This particular part is used 12 times on each engine. For Doug to create this proof of concept he utilized many of the tools that Sintavia has on-site to design and manufacture the part. The first step in the process was to capture the geometry of the original part using a blue light scanner. Once the scan was complete, Doug and his team created a high-fidelity CAD model to the exact specs of the original geometry. According to Doug, “Next we determined all of the loading conditions that the part would incur during its usage. Using Altair Inspire, we applied these to the model and after separating all design and non-design spaces, we ran multiple optimization iterations on the part. These included multiple rounds with modified design spaces, testing of different compression, factory of safety, etc. Finite element analysis (FEA) was then run on the results to compare and determine the best optimization iteration to move forward with.” Once a final Altair Inspire optimization result was selected from the multiple options, Doug and team used the PolyNURBS tools inside of Altair Evolve to refine the optimization into its final geometry. After the final optimized geometry was created, Sintavia used its SLM Systems’ 280 twin laser machine, coupled with Inconel 718 powder to produce the part. Post manufacturing was also completed on the part to ensure it was ready for testing and ultimate use. First Sintavia performed in-house vacuum heat treatment on the part, next it removed the part from the build plate using EDM (electrical discharge machining). Additional steps included support removal, sand blasting and polishing, and hot isostatic pressing to eliminate any voids or cracking in the part. Sintavia has since run multiple tests on the part including proof testing with a load of 5000lbs, fatigue testing, metallurgy testing, and more. In all tests, the new (optimized printed) part outperformed the original. The new part has a 3x fatigue life and less porosity than the original, all while weighing in at ~15% lighter. 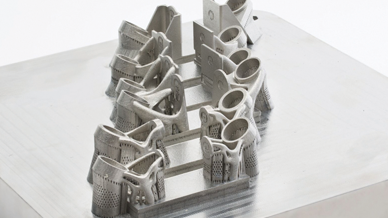 Prove the ability to additively manufacture optimized aerospace replacement parts that exceed existing part’s mechanical and operational properties while decreasing the overall weight. Concept generation with Altair Inspire and manufacturing with SLM 280 machine to create on-demand replacement brackets with improved performance and weight characteristics. Founded in 2012, Sintavia is the global leader for independent metal additive manufacturing (AM) in support of critical industries, including Aerospace & Defense, Oil & Natural Gas, Automotive, and Ground Power Generation. The company is committed to parameter optimization and quality serial production of metal parts that meet or exceed the exacting standards of these industries. With six high-speed printers from four of the largest global OEMs co-located alongside a hot isostatic press, and a multitude of other state-of-the-art machinery/technology, Sintavia is able to optimize parameters, serially manufacture, and audit quality much faster than any of its competitors.